Available: Amazon and wherever VIZ Media LLC are sold! All high school freshman Airi Hoshina ever wanted was to someday live in a cozy home with a loving husband and find joy in the little things in life. As a result, she makes it her daily mission to get to school on time because school legend has it that the longer one's non-tardy streak is, the better boyfriend one will find. But just when her daily routine is working like clockwork, an occurrence of fairy-tale proportions threatens to disrupt her grand plan. 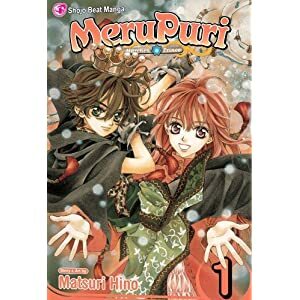 On the way to school one morning, Airi loses her mirror—one that has been passed down to her through generations—and suddenly finds herself in a bizarre situation. Never in her wildest dreams did she expect Aram, a little boy from a magical kingdom, to have emerged from the mirrior in the short time it took her to track it down! Why you want this manga: This is one of the cutest mangas of all time. (Also, while I was looking this up, I discovered this author is behind Vampire Knight... Holy crap!) It's about a girl who meets this little boy, and he quickly falls in love with her... and sometimes he grows up into a teenager her own age! Don't worry, it's not super creepy--she only likes him when he's a teenager. But he has the cutest line of all time in this story... At one point he's a teenager and he tells her to kiss him to return him to his normal size because, "She seems uncomfortable around him when he's grown up." It's so sweet! *squeal* It's your typical fantasy shoujo manga, a cute little love story, and you can't help but fall in love with Aram--a true prince!